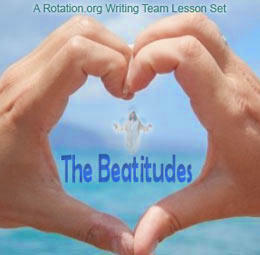 In addition to these public Beatitude lessons and ideas below, be sure to visit our Writing Team's Beatitudes lesson set whose lesson summaries and Bible background are open to all. Our extra creative and detailed Writing Team lesson sets are written by and for supporting members. 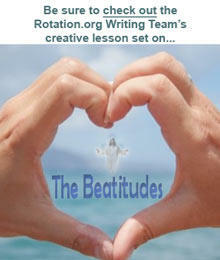 The Rotation.org Writing Team has posted a superb Beatitudes lesson set! It includes complete lesson plans for art, drama, games, computer, cooking, and video workshops. It also includes an especially fun "Rhythm" workshop. The WT's Lesson Summary and Bible Background are open to the public. The lesson plans themselves are a major benefit of being a Supporting Member. You'll definitely want access to these lessons even if your church is not using the Rotation Model for Sunday school. Very memorable lessons!